The former Liverpool midfielder has made his first step on the managerial ladder with the Scottish club. STEVEN GERRARD FEELS the opportunity to take over at Rangers was a “no-brainer” and he is looking forward to the pressure of his first job as a manager. Gerrard signed a four-year deal with the Scottish Premiership side on Friday and will be tasked with ending the seven-year dominance of the league by Old Firm rivals Celtic. The Liverpool legend, who succeeds Graeme Murty at the club, will start work on 1 June and Gerrard confirmed former team-mate Gary McAllister will be his assistant at Ibrox. 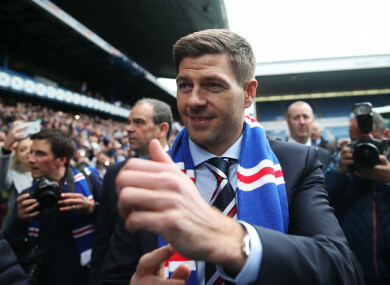 And after previously being linked with MK Dons, Gerrard believes Rangers is the right club to step into senior management, having worked at Liverpool as an academy coach this season. “I needed to weigh up a lot of things but a huge opportunity presented itself,” Gerrard told a news conference. “I’ve been lucky enough to come up and sample some Old Firm games. “When the call came it was a no-brainer for me. I had a different feeling in my stomach about the other opportunities I had to be a manager. From that first phone call I had a special feeling, I knew Rangers was for me. Gerrard rejected the suggestion his appointment represents a risk for Rangers due to his lack of experience. “It’s not an issue for me, I respect everyone’s opinion,” Gerrard said. ”I’ve been around a big club and big matches for a long time. I’ve watched big managers, I can’t do anything about not having experience but I have the right characteristics to take on the challenge. “I’m looking forward to the schooling. Pressure’s not a bad thing for me, I’ve always lived under it. In football if you’re working under pressure you’re in a good place. I’ve missed that pressure since I stopped playing football. That’s why I love being involved in football. Joining Rangers means Gerrard will face off with his old boss at Liverpool, Brendan Rodgers, who is on track to lead Celtic to a second successive domestic treble having masterminded two heavy Old Firm victories in the last three weeks. “I haven’t spoken to Brendan recently,” former England captain Gerrard said. “But we are fine, we’ve always been fine and I’m ready for the challenge. “I knew straight away from the phone call I wanted to look into it but of course I’ve spoken to friends and family and people in the game I’m tight with. I won’t give any names. “My assistant will be Gary McAllister, he’s a long-time friend of mine and I played alongside him at Liverpool. I have huge respect for him and while I don’t have a lot of experience, he has been around the game for a very long time. As a partnership, that will be strong and he will be a rock for me. Email “Gerrard: 'Rangers job a no-brainer, I knew it was for me'”. Feedback on “Gerrard: 'Rangers job a no-brainer, I knew it was for me'”.